Science is beginning to find ways to control happiness in the brain artificially. Since the dawn of time we have sought short-cuts to happiness. Early man got high on psychotropic drugs. Alcohol has been around since the stone age. The designer drugs of today promise ecstasy in a pill. Now neuroscientists are beginning to manipulate happiness in the brain. In a series of experiments in the 1950s and 1960s psychologists pinpointed the pleasure zones in the brains of rats and eventually in human patients. 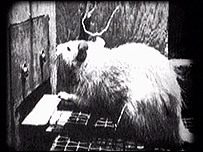 In 1954 Peter Milner and James Olds performed a radical experiment on rats. They implanted electrodes into rats' brains, and found that when they gave electrical brain stimulation the rats seemed to experience pleasure and almost ecstasy at times. The rats could press a lever which would deliver a small current deep into its brain. It was found that they would perform complex and difficult tasks for another dose of stimulation, and would even press the lever up to 2,000 times an hour to the exclusion of eating or drinking. Olds and Milner concluded that they had discovered the area of the brain responsible for reward. 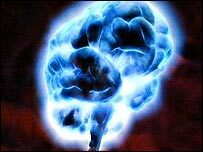 In the 1960s, psychiatrist Robert Heath of Tulane University in New Orleans chose to use this same deep brain stimulation on humans. He performed a series of experiments where he put electrodes deep into his patients' brains. Bob Heath hoped to cure depression, pain, and addiction. But controversially he also experimented on gay men. When a mild shock was administered to patients they felt good. When they were handed the controls they chose to press repeatedly - sometimes over a thousand times. But the pleasure stopped when the current was stopped and Heath eventually abandoned his work. In the last few years interest in deep brain stimulation has been taken up by mainstream medicine to help patients with Parkinson's Disease and also to tackle acute pain. We met Robert Matthews who had had a leg amputated after an accident. Robert still suffers excruciating pain from the leg that no longer exists. "My lowest took me so low. I couldn't even think about myself or my family or anything. That's how far I went. So happiness had gone." An operation by Professor Tipu Aziz, consultant neurosurgeon at the Oxford Functional Neurosurgery Group, meant that the pain could be massively reduced and life for Robert became bearable. Professor Aziz has implanted an electrode in his brain which can in a sense make him happier. The electrode is controlled by a switch which is in his chest. Richard is now free to control the voltage delivered to his brain and thereby reduce the pain he suffers. "I used to worry about the fact of having something in my head but now I don't look at it like that. "I mean, it works to a percentage, which gives us a better way of life than what we had before." So could this be an idea for the future? Morten Kringelbach, a neuroscientist from Oxford University, thinks it is still a long way off. "The prospects of actually putting an electrode in and permanently changing people's happiness, and that is the state of contentment over time, I think the only way that one can do that is by changing the circumstances that people are in." Dr Kringelbach says it is possible to manufacture pleasure. But the priority is to use the science to alleviate pain and depression. But Robert Matthews was in no doubt that if he was offered not just the chance to get rid of his pain but actually to make himself feel positively happy he would turn his switch up to the happy level. "Oh definitely. Most definitely all the way. Take it all the way, yes. That would be a happy day, wouldn't it?" But films and literature have seen the idea of artificial happiness as sinister. In the 1930s novelist Aldous Huxley wrote about it in his book "Brave New World". The idea of synthetic emotion is also explored in the film The Matrix. In our opinion poll we asked whether people would take pills that made them happy if there were no side-effects. Three out of four people said "no thanks". Leading psychologist Professor Ed Diener argues against artificial routes to happiness. "We do not want to create a society that's happy because of drugs. "Society that's locked into happiness, we still want people with functioning emotion systems, systems that react when bad things are happening, and react when good things are happening." And it is a thought echoed by Professor Paul Salovskis, clinical psychologist at King's College London. "It seems to me that drugs as a solution to unhappiness are rather similar to kind of, you know, say plastic surgery to enhance your beauty or whatever. "The quick fix is potentially on the horizon but I think it will keep receding as it already has. "We were promised years ago that we would have the pharmacological solution to all of emotional problems - it hasn't happened." Mark Easton presents The Happiness Formula on BBC Two on Wednesdays at 1900 BST.